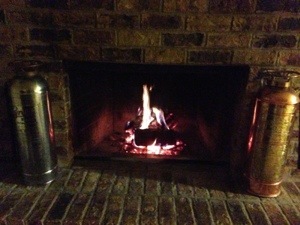 Okay, I think it is safe to say the weather outside is frightful, but the fire is so delightful. With so many Texans without power, I’m loving our cozy fire Man made this morning before he left for work. (yeah, firefighters, police, and hospital staff don’t get to call in…we thank them for their diligence) SO, I’m looking at a day indoors with super excited kiddos. What to do, what to do…. Last night, we kicked Kiddo’s first snow day off right – pulled a mattress into the living room, piled on, and watched How the Grinch Stole Christmas (don’t worry, the Sound of Music is safely stowed on my DVR). Then talk started about s’mores (of course), but Mom hadn’t bought s’mores stuff (the dismay, I know!). 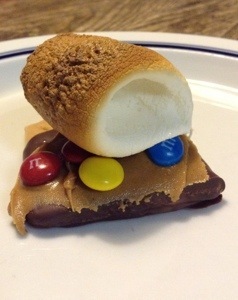 Kiddo starts brainstorming the awkward s’mores from what we did have in the pantry. Then Man gets to thinking. 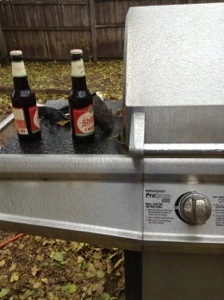 It kind of reminds me of Tim Taylor on Home Improvement sometimes. I can hear Tim Allen saying, “need more power!”. Well, more power we got. Introducing Man’s More S’more: Graham cracker, dipped in semi sweet chocolate, topped with creamy peanut butter, sprinkled with M&Ms, and topped with the self proclaimed perfectly toasted marshmallow. Well, it was. Verdict. “Pretty darn tasty”. Well, it was. Play doh, perusing my christmas craft Pinterest board for some coloring sheets and quick crafts we can do, Christmas stories of course, some holiday decorating, build a Thomas super track, make a race car track for the hotwheels. Pitching the tent in the living room of course! Not for me! Man is going to need something after that commute. If you need some help brainstorming, check out Jamie’s ideas for burning off some of that excitement, or Greta has some awesome indoor activity ideas. We may be using some of grandma’s yarn later for some spy/ninja training. What are you up to today? ?